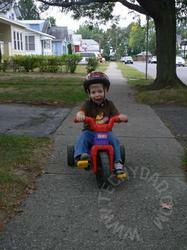 All summer, JSL, envious of his brother’s “big kid” bike, has wanted to ride his tricycle. Unfortunately, he couldn’t figure out the pedals and would wind up insisting that I push him. Of course, he being so low to the ground and me being so high up meant that I needed to bend down and put pressure on my back. A few minutes of pushing later and he was squealing for more oblivious to my growing back pain. 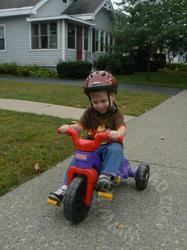 Recently, we tried pushing a big wheel bike we had for him instead of the tricycle. My theory was that this bike would give him better leverage and he would learn to pedal it better. Sure enough, after a bit of practice, he was pedaling like a champ. In fact, he was pedaling too fast! Most of my photos of him from the front are blurry. I would run in front of him to give my camera some “focus time” but he would be moving too quickly. Still, he was having a blast. And he didn’t just pedal up and down our block. He wanted to go for a ride *around* our block. We set off, leaving NHL and B behind, with me on foot and JSL on bike. As we walked/rode, we stopped for red lights. Not because we had to, mind you. We weren’t crossing any roads. No, we stopped because JSL insisted that we need to stop at red lights. He’s already following the rules of the road. Around we went, all 1,800 feet or so. (Yes, I Google Map’d it.) Then, he insisted on going around a second time. He would have likely gone around a third time, had I let him. However, while we stayed on our street from here on out, he kept pedaling up and down the block. He easily biked a mile by the time he was done. At the end of his bike adventure, and after NHL had done some biking of his own, I let JSL try out NHL’s bike. 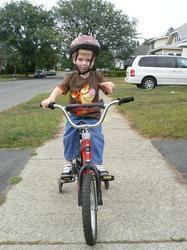 He can’t quite reach the pedals when they go down, but he might be able to use NHL’s “big kid” bike next year. NHL was worried about this prospect as his bike was our birthday present to him last year. We assured him that, when he eventually grows out of his current bike and gives it to JSL, he would get to pick out a bigger bike to ride himself. Perhaps B and I will also get bikes and we can go on family biking trips around the neighborhood!